Sorry to re-use a headline—c'mon, it was from 2009—but in this case it applies in spades. 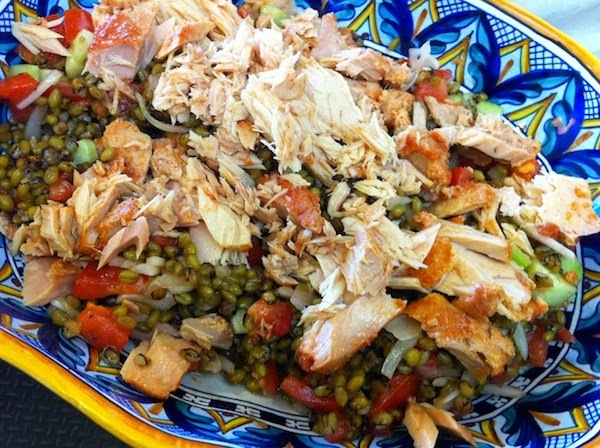 This recipe for tuna, Oregon albacore, actually, is so good you may never buy the canned stuff again. And I hate to say it, but even the locally processed, line and pole-caught stuff in jars can't hold a candle to its silky moistness. I'll admit that the beginnings of this one particular piece of fish weren't all that pretty. We always try to buy a whole albacore when it goes on sale at the beginning of the season, but at some point in the past I forgot to write the purchase date on the packages containing the loins. Apparently this particular loin had been buried in the freezer for a year-and-a-half or so, and by the time I pulled it out and thawed it, I saw the damage…freezer burn on most of the surfaces. Figuring I had nothing to lose at this point, I started shaving off the burned bits, thankfully revealing the lovely pink flesh below. Whew! A whole loin is about two pounds of fish, so after cutting it in four chunks, I rolled it in some herbs, garlic and salt and put it in a dish on the counter to marinate for a couple of hours. Then all it took was transfering the pieces to a saucepan and pouring in a decent-but-inexpensive olive oil to cover. The next part was critical, though…you want to heat the oil sloooooooooowly. Apparently if the oil is heated too quickly, the surface of the fish seizes and the flesh turns out dry and hard like you often find in canned tuna. But cooked properly, it's terrific on its own as a tapas-style appetizer, or it can be mixed with pasta and grains for a stunning main dish. You could also make it into what will be the most amazing tuna sandwich you've ever had. Use your imagination! 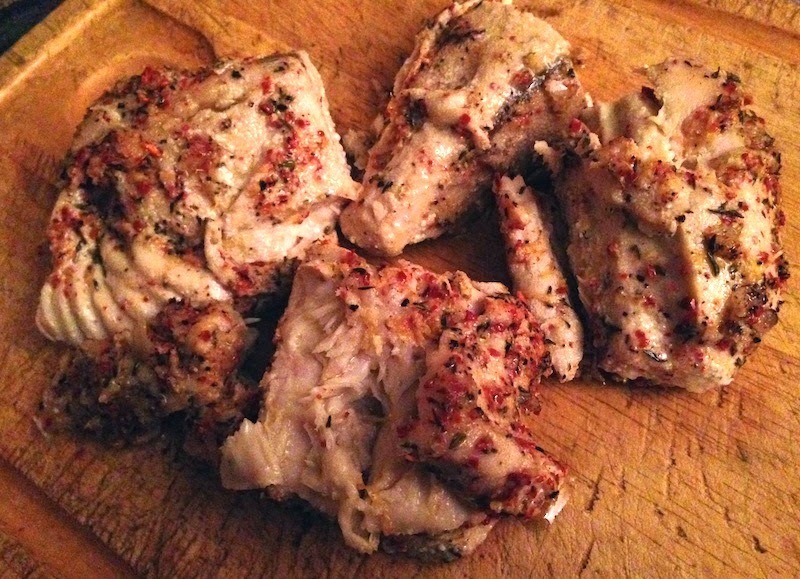 Cut trimmed loin in four pieces. In a shallow pan, mix salt, chili flakes, thyme, garlic and lemon zest. Roll tuna pieces in the spice mixture, making sure to cover all surfaces (this doesn't have to be thick, it's just a rub). 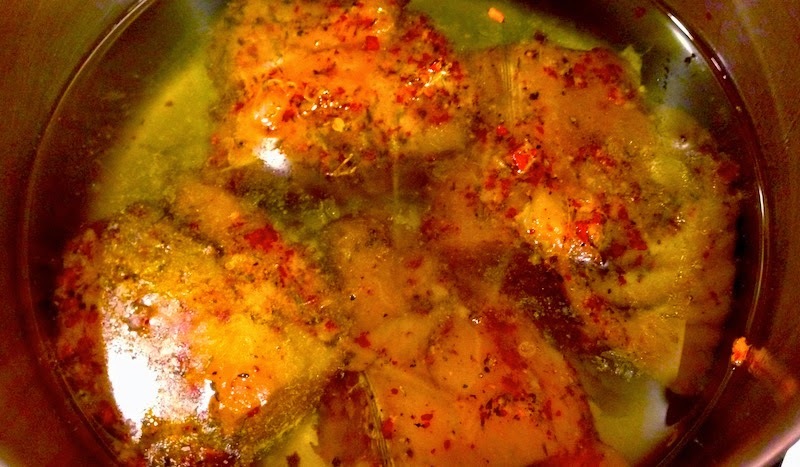 Place in dish on counter for at least a couple of hours or covered in the fridge if you're marinating it longer. Place fish pieces in a saucepan and cover with oil. Put over very low heat and, using an instant-read thermometer, slowly raise the temperature to between 140-150°. Maintain temperature for three to ten minutes, or until the center of the thickest piece is almost cooked through. (You can use a fork or knife for this purpose.) Turn off heat and allow the oil to cool. Remove fish from oil. Strain remaining oil through a fine mesh sieve. If you're not using all the fish right away, place it in a container that has a tight-fitting lid. Cover the fish with the strained oil and seal. It will keep in the fridge in its oil for a couple of weeks. Any remaining oil can be used for dressings or other purposes—it has a fantastic flavor! For more information on Oregon albacore, read "Oregon Albacore A to Z." 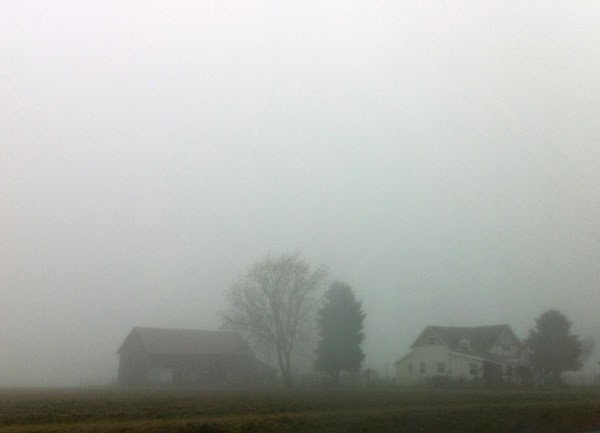 Contributor Anthony Boutard of Ayers Creek Farm takes a moment to remind us that, if you stop to think about it, even in the cloudy grey Willamette Valley there's some sun to be had every day. The ringing cowbell announcing the opening of the Hillsdale Farmers Market at 10 a.m. tomorrow also heralds another installment of last summer's sunshine carefully stored by nature in the first instance, and by us in the second. Loganberries and raspberries harvested following the summer solstice still glow in the jars of preserves, and on your toast next week. Likewise the frikeh was harvested and roasted on the longest days. The currants and gages finalized their flavor in the midsummer sun, when people still take the season's heat for granted, waving it aside. The corn, cayennes, squash, beans and pumpkin seeds entered their maturity as the yellow of school buses reminds us to linger a bit longer before the warmth is truly precious. When we bring in the fiori d'inverno, the flowers of winter, this week, the roots that create those beautiful chicories fattened up around the autumnal equinox. 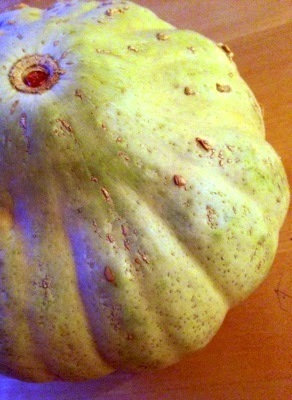 Likewise the sweet potatoes and spuds, and the leaves that form the onions. The quinces and grapes captured their summer moment a bit tardy, ripening in the last rays of sun after the equinox. The diversity of organs that store the sun's energy is also striking. There are seeds, fruits, leaves and stems all in the mix, all accomplishing the same storage function. With time, they are continuing to mature and their flavors are changing. 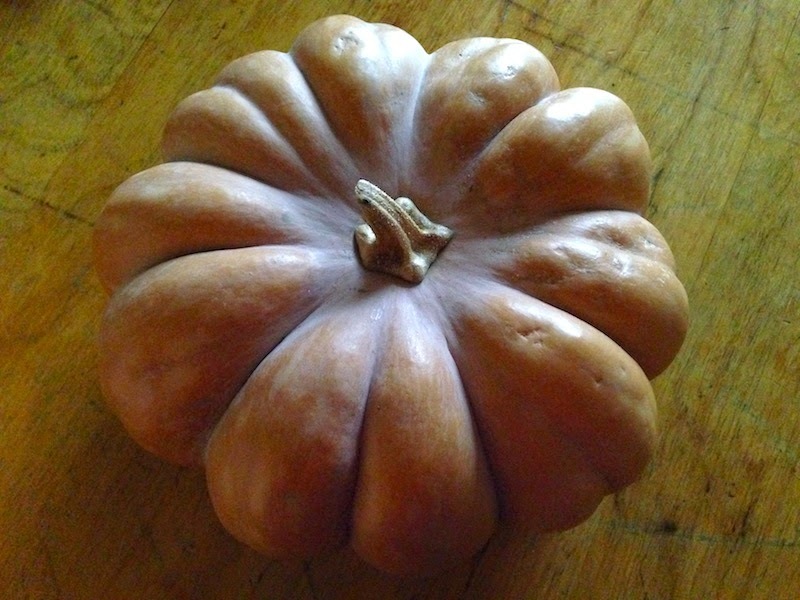 This week, we encourage you all to try a slice of the hard-skinned Sibley squash and the purple sweet potatoes, both of which reach their prime in terms of sweetness and flavor in late January. For those on quest for ever more anthocyanins in their diet, the purple sweet potatoes have intense concentrations of these desirable pigments. Finally, a nod to that great perennial root, the horseradish, which accumulates several years of summer light before it is ready for harvest. With that, we hope to see you all anon. I've been wandering around our Portland neighborhood with great regularity for years—I have dogs that love a good daily ramble, after all—monitoring the progress of the seasons. 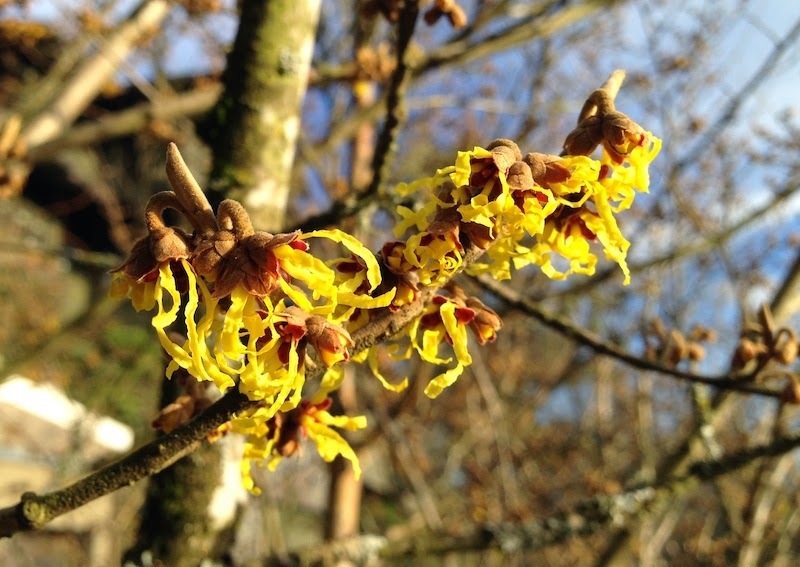 Which trees start blooming when, whether the daffodils are starting to show their green shoots under the dogwood tree, if the witch hazel at the bottom of the hill is scenting the air with its frilly blooms. And I gotta tell ya, this has been one crazy winter. It's barely past the middle of January and the ornamental plum down the street is throwing out its tiny pink blossoms, the camellias are busting out all over and I even spotted a few little claytonia perfoliata (top photo) popping up through the bark dust in a parking strip. Climate change real? Yeah, I sorta think so. 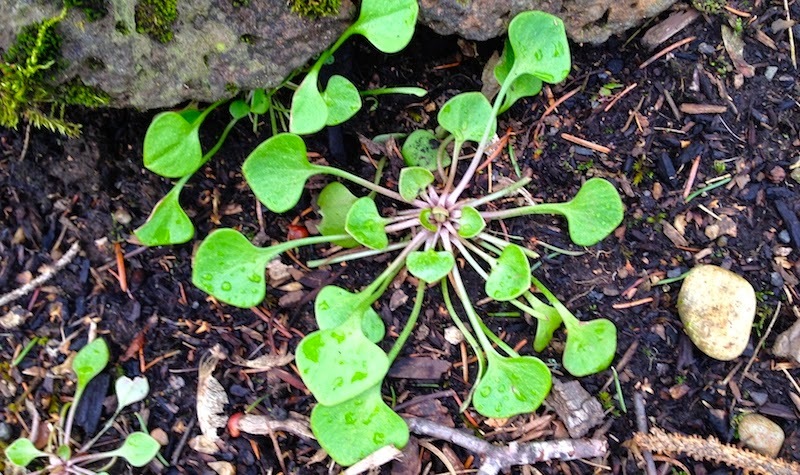 If you can get your hands on some, the tender greens of miner's lettuce are terrific in a salad. 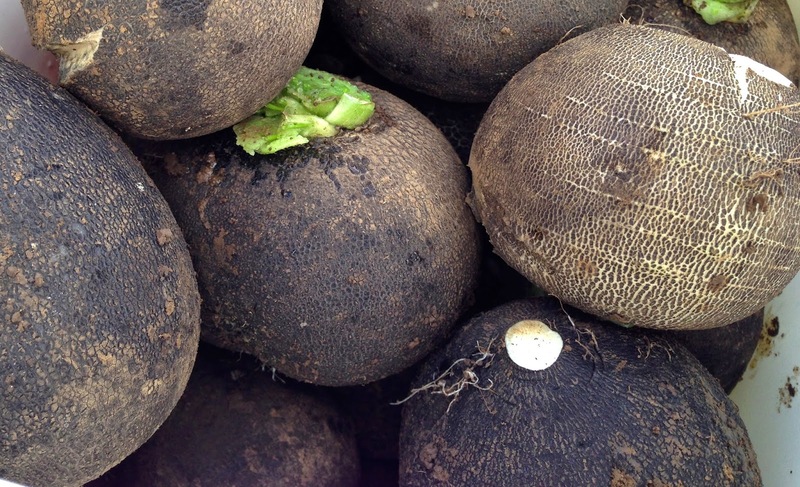 Known to contain vitamin C, potassium, iron and magnesium as well as vitamins A, E and B, the black radish also possesses an ability to fight off infection and promote healthy digestive function. Dried and powdered, it's found in herbal supplements and is used in homeopathy to treat thyroid imbalances and improve liver function. 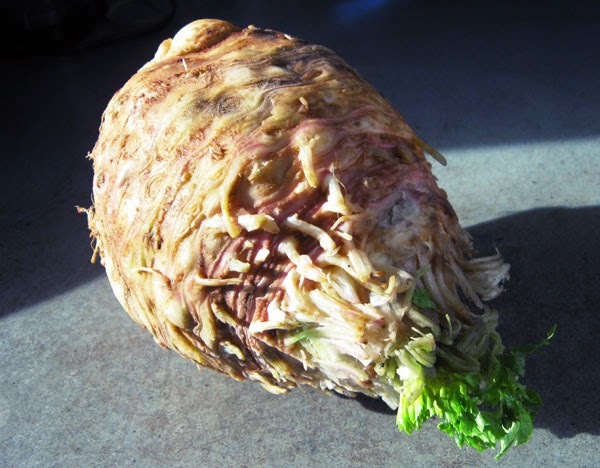 Not being a big one for stuffing myself with lots of supplements, preferring instead to fill my belly with delicious things in their more natural state, I was pleased to discover that the black radish lends a peppery bite to a root slaw. 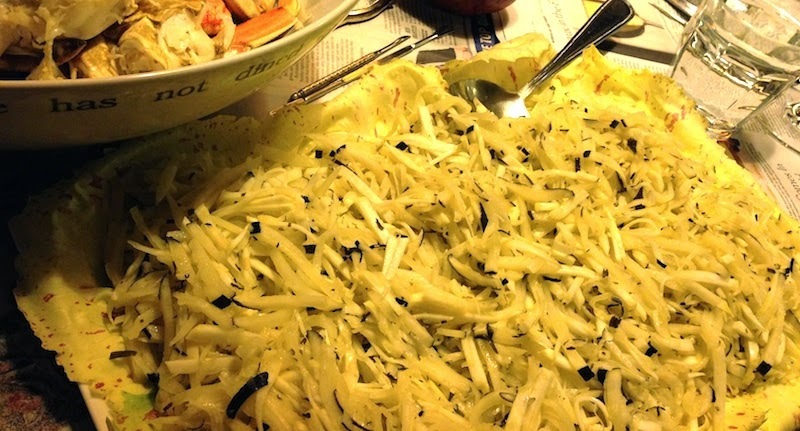 Having volunteered to bring a salad to a crab feed and inspired by the two black radish salads concocted by Linda Colwell at this year's Ayers Creek Farm Ramble, I hauled out our trusty mandoline and went to town. I wasn't sure how many radish fiends were in the crowd and didn't want to overwhelm the crab with the sometimes strong heat and bitterness that some of these members of the brassica family carry. Following Linda's lead, I salted down the julienned radishes and let them stand for a couple of hours on the counter, which tames some of their harsher, peppery tendencies. A quick rinse to wash off the salt, draining them well and then drying them in an absorbent dish towel and they were ready for the salad bowl. There were a couple of small globes of celery root (right) in the vegetable bin that hadn't gone into a root vegetable stew the week before, so while the radishes enjoyed their salty spa treatment I julienned those as well, figuring their mild celery flavor and crisp texture would add a nice touch to the finished salad. Since for once I was running ahead of schedule, I made up a quick lemon vinaigrette and doused the rooty mixture, tossing it well and putting it in the fridge so that the flavors could mingle until we left for dinner. A couple of tosses in the interim and then a final toss before serving, and this simple salad was declared the belle of the ball. Scrub radishes to rid them of any dirt or dust, but don't peel. Using a mandoline, julienne them into matchstick-sized pieces. Put the julienned radishes into a large bowl, add the 1/2 cup salt and stir to combine. Let sit on the counter for a couple of hours. While waiting for radishes, make the dressing by whisking lemon juice, oregano and 1/8 tsp. salt into olive oil. * Set aside. When salted radishes are ready, rinse them well under running water, drain in a colander and dry them with an absorbent dish towel (I love flour sack dish towels for this purpose.) Add them back to the bowl, julienne the celery root (if using) and add them to the radishes. Pour the dressing over the top, stir to combine and put the salad into the refrigerator. Stir occasionally. Serve. * You can also add a tablespoon of Dijon mustard and a crushed garlic clove to make a mustard vinaigrette. 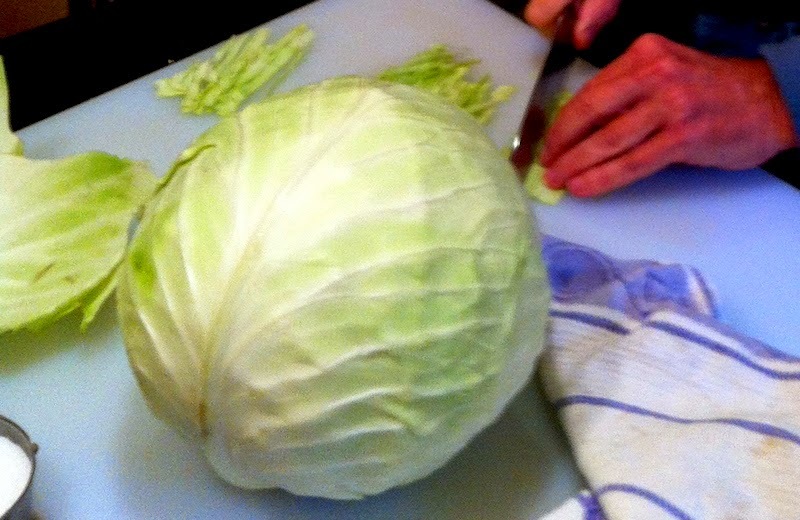 I can't think of anyone I know who adores cabbage more than contributor Jim Dixon of Real Good Food. Fresh, sautéed, braised, pickled, fermented or fried, you'll find it making an appearance on his table. Here he shares his favorite ways to prepare it. And I’m not talking about Savoy cabbage, the frilly version that’s been tarted up with a first name hinting of royalty. Or the other members of the Brassica oleracea family, including the various kales and collards, broccoli, kohlrabi, cauliflower, and Brussels sprouts, deliciously gorgeous as they are. Or the strangely compelling relatives from central Asia, original home of turnips, broccoli rabe, bok choy, tatsoi, and mizuna, all part of the Brassica rapa clan. No, my heart belongs to the ordinary, everyday cabbage, its pale green leaves tightly bound into a waxy ball, the humble heads tucked coyly away in the corner of the produce section. It’s cheap, reliable, and flexible; who wouldn’t fall in love? It doesn’t hurt that cabbage is good for me, lends itself to last-minute cooking, doesn’t cost much and grows, relatively speaking, in my own backyard. Humankind’s relationship with Brassica started early. In his encyclopedic work Food: An Authoritative and Visual History and Dictionary of the Foods of the World, Waverley Root relates one ancient Greek belief of its origins: Dionysus, the god of wine, caught Lycurgus, the Edonian king, pulling up grapevines. While awaiting punishment, the king wept, and from his tears sprang cabbages. An alternate myth has Jupiter sweating as he tries to explain contradictory oracles, and the cabbages sprout from his perspiration. Those ancient Greeks might’ve been on to something. But given my devotion it seems more likely that Eros, the god of love, was involved. Wild cabbages, resembling kale more than my beloved green globes, grew along the Mediterranean coast, and according to Harold McGee, in his book On Food and Cooking, the “salty, sunny habitat accounts for the thick, succulent, waxy leaves” that make cabbages so hardy. 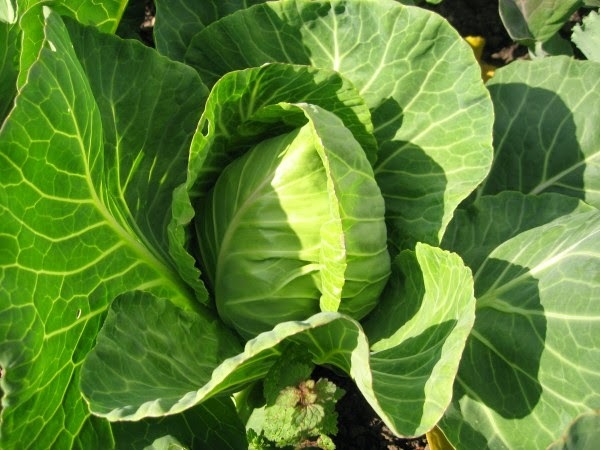 Domesticated about 2,500 years ago, cabbage spread across Europe. Because it tolerates cold weather, cabbage became an important staple farther north, and we typically associate it with the hearty cuisines of climes damp and gray. Our name for these derives from the colloquial French word for head, caboche. Vegetable lore tells us that the Italian Catherine de’ Medici brought cabbage to France when she married fellow 14-year-old Henri de Valois, the Duke of Orleans and, eventually, King Henry II. History is silent as to whether she called him mon petit chou, or “my little cabbage.” But the endearment reflects the continuing French love of cabbage, from the choucroute of Alsace to the thick stew called gabure in the south. Early cabbage fanciers also associated it with good health. Egyptians ate it with vinegar to prevent hangovers, Greeks dribbled cabbage juice into sore eyes, and Romans packed aching muscles with cabbage poultices. 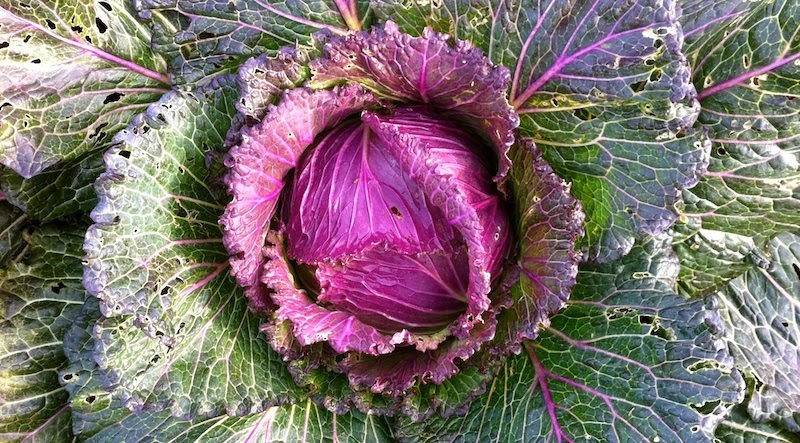 Herbalists today recommend cabbage for its anti-inflammatory effects, telling breastfeeding mothers to tuck a few bruised leaves into their bras for relief. It’s got lots of vitamins A, B, C, and E, and a study at Georgetown University showed how phytochemicals in cabbage might reduce cancer risks. However, those same phytochemicals provide the frequently noted boardinghouse smell of overcooked cabbage, something that bothers others much more than it bothers me. Maybe I’m blinded, in an olfactory sense, by love, suffering from a cabbage-passion-induced anosmia. Or perhaps my approach to cooking mon petit chou reduces the breakdown of glucosinolates, the sulfur-containing compounds released when cabbage is boiled too long. More likely, it’s the variety of cabbage. Brussels sprouts contain more of the healthful and stinky compounds than any of the other Brassicas. Heading cabbages, with their residual sugars, offer a sweeter love. Farmers here in the Pacific Northwest harvest cabbage from mid-July through the end of December. Properly stored, it keeps for up to six months, so it’s theoretically possible to eat local cabbage all year. Prices vary, with conventionally grown cabbage usually less than a dollar per pound, organic about half again as much. Just before Christmas I bought an enormous head at a farmers’ market for only two dollars. So, how do I love cabbage? Let me count the ways. I love it cooked in a little olive oil with onion. There’s a head of cabbage in the refrigerator and onions in the pantry most of the time, so I make this almost every week. Cabbage loves pork, and I love them together. In my Cabbage with Bacon and Crème Fraiche, I start with a little diced bacon, then sauté the onions and cabbage in the smoky fat. A dollop of crème fraîche makes both of these simple dishes unctuous and rich. A bed of shredded cabbage roasted under a chicken steals my heart. I love how the cabbage I add to my feeling-a-cold-coming chicken soup gives it enough substance to fill me up. I’m crazy for coleslaw, the green salad I turn to when winter’s lettuce comes wilted from a long truck ride north and again when the hot summer sun makes my garden’s leaves bolt and turn bitter. Je t’aime, choucroute braisée à l’Alsacienne: Julia Child kindled new passion for sauerkraut by teaching me to simmer it slowly for hours in crisp white wine. 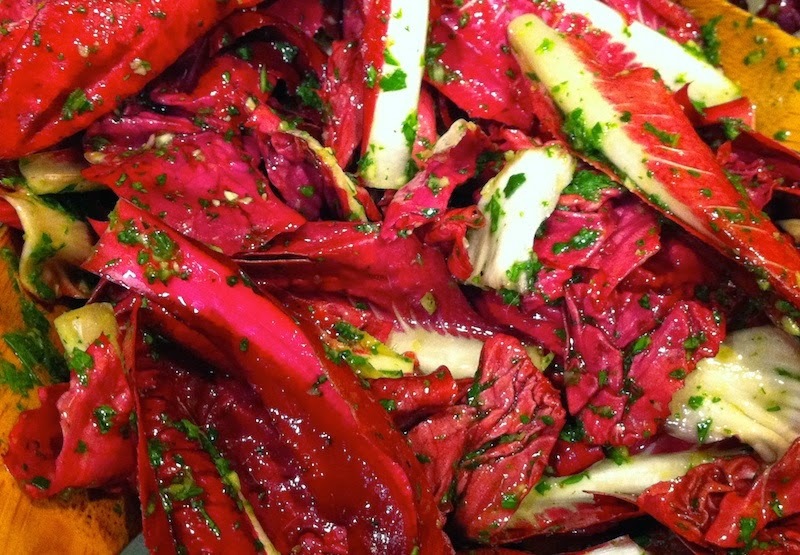 And Marcella Hazan makes me cry, “cavolo sofegao, come sei bella,” with her Venetian-style smothered cabbage, another slow-cooked dish transformed with a splash of vinegar. Here's my Braised Cabbage and Onion with Poached Egg. Te amo cocido, tambien. While these one-pot Spanish stews often call for whole chickens, pigs’ trotters, veal shanks and a garden’s worth of vegetables, I make a simple version with just garbanzos, potatoes and cabbage. Cabbage love comes in many other forms, and though the steady routine of our long-term relationship provides familiar comfort, I don’t want it to get stale. So I keep searching for new outlets for my passion, different ways to express my feelings, unexplored culinary territory where I can say, again and again, I love cabbage. 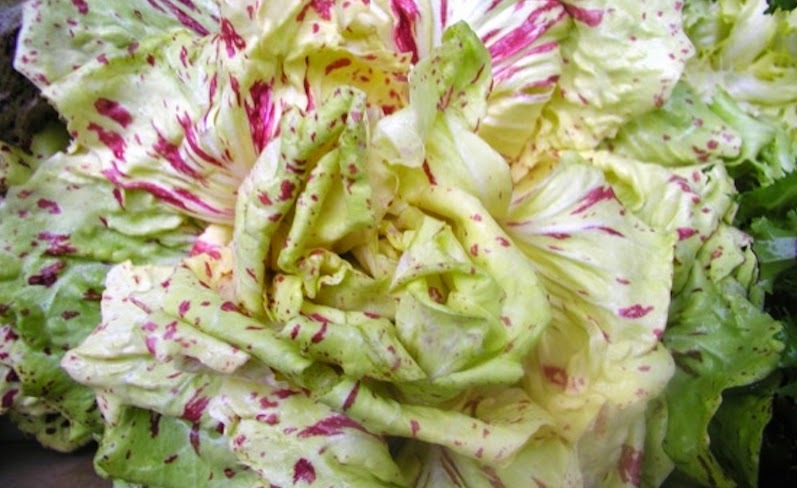 Leaf chicory, as well as the type known as radicchio, is a frilly beauty when found in a winter salad, though it can sometimes have a slightly bitter edge that some find too aggressive. Contributor Anthony Boutard of Ayers Creek Farm explains where this flavor comes from, and how to sweeten its personality. This is the season for chicories. At the moment they are the speckled Lusia types. 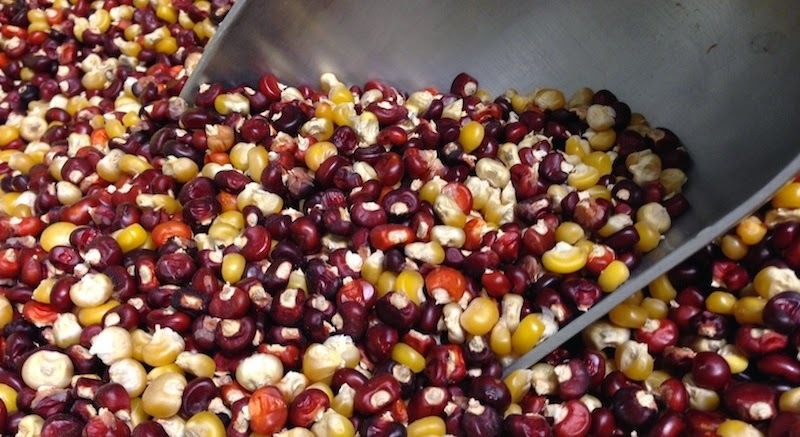 We have had trouble with the quality of the seed, so there is a lot variation in the field, and we are only able to harvest about 10% of what we planted, which is way below the 90% harvested in the past. We are not happy with the state of seed, to put it mildly. In February, we will have longer meditation about the genetics of chicories, and what we are doing to address the problem. As with Bette Davis and the lyrics of Sondheim, the bitterness in chicories is always a matter of interpretation and taste; some revel in it, others recoil. Varieties and individual plants vary as well. The bitter compounds are in the white latex of the sap and are water soluble, so the problem is easily addressed. Tearing the leaves lengthwise and immediately soaking them in iced water draws out the latex and eliminates almost all of the bitterness. Soaking for 20 minutes or so is generally enough. If you are planning to braise the chicories, quarter them lengthwise and immediately soak in ice water. As with latex paint, if the plant's latex starts to set up and dry, it is no longer water soluble, so having soaking water ready before you tear or cut the heads is important. The ice is critical to the process because the cold shrinks the vascular tissue, forcing the latex out of the leaf. Lukewarm or cool water is useless for the task, so don't skimp on the ice. For a salad, a lemon-based dressing adds a bit of sweetness. Cutting vinegar with a bit of orange juice also works. An anchovy fillet squeezed through a garlic press and mixed into the dressing is another fine addition. As a forage crop for livestock, chicories have higher protein content than even legumes such as alfalfa, as well as a hefty dose of minerals. 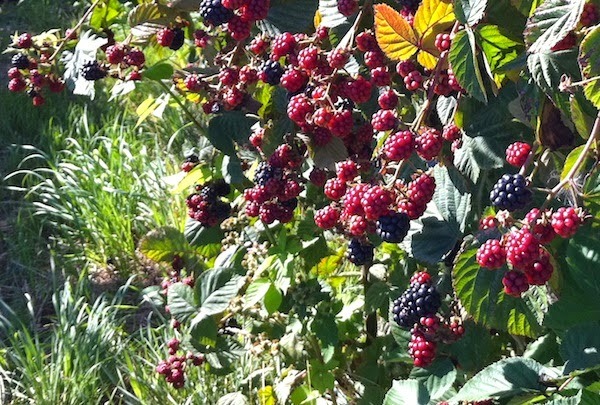 As a result, in recent years seed companies have been offering a greater range of forage chicories, apparently with better seed quality than we see in the varieties grown for human consumption. 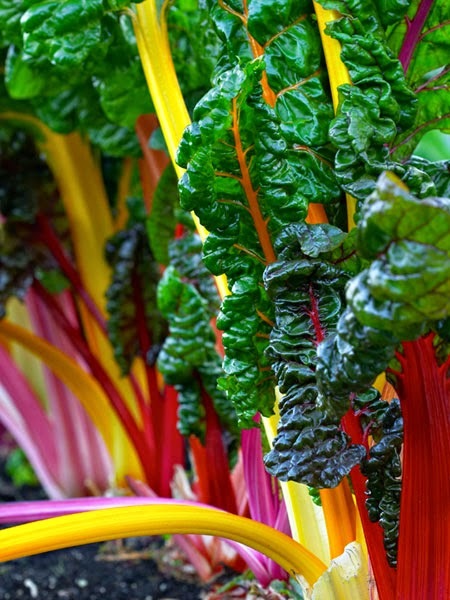 Regardless, you can't go wrong eating these fine winter greens, right Elsie? This blog is about my ongoing journey to discover the connections between what's going on in the field and what I put on my table. It took me awhile to realize part of that road makes a detour through the halls of the Capitol building in Salem. 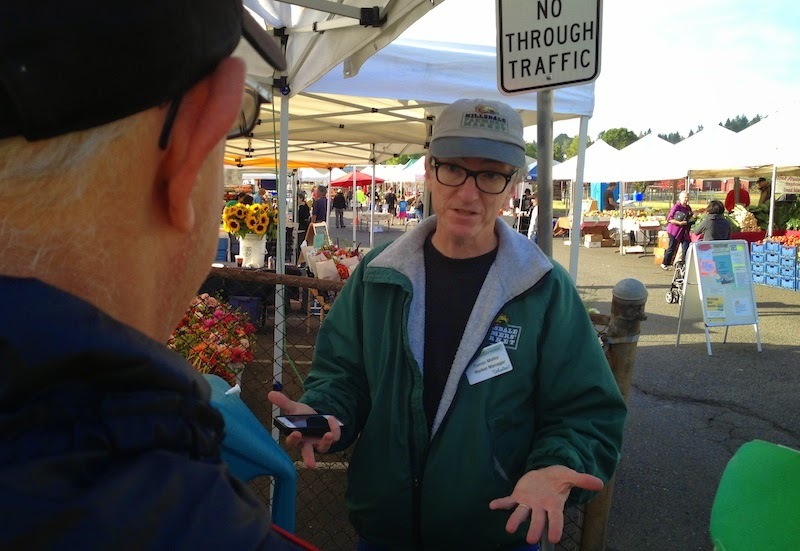 In other words, the decisions that our elected officials make about agriculture in Oregon directly affect what I'm going to feed my family, whether I buy it at the farmers' market or the grocery store. With the opening of the 2015 regular session of the state legislature, I thought it might be helpful to sit down with Ivan Maluski, the Director of Friends of Family Farmers, an organization working to promote and protect socially responsible agriculture in Oregon, and get the bullet points on what's he's paying attention to this session. 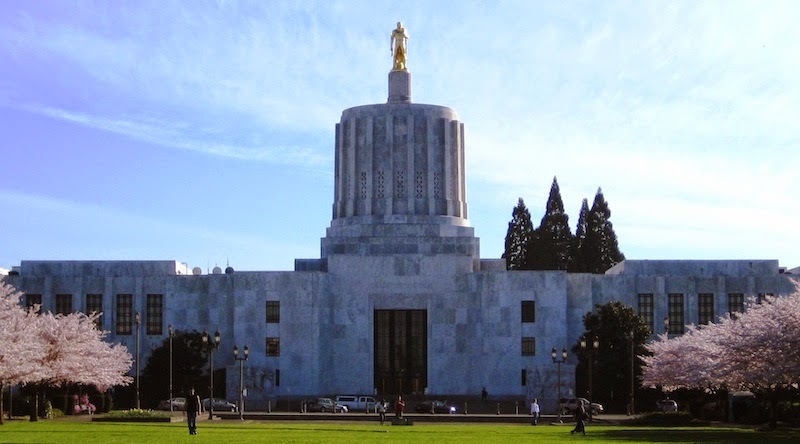 Senate Bill 207: Authorizes the Oregon Department of Agriculture to establish control areas to allow for the regulation of genetically engineered crops to prevent conflicts with growers of non-GMO crops. 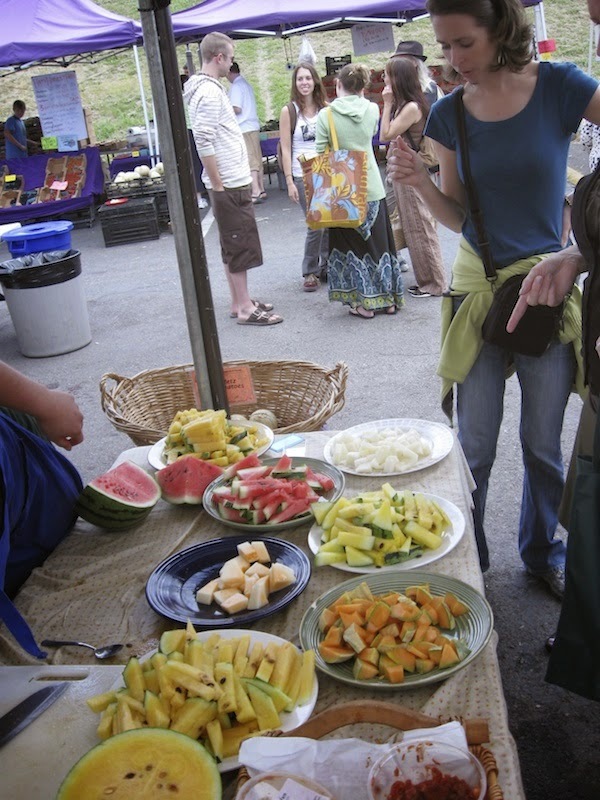 The ability of communities to make decisions about their local food systems as well as assuring farmers that the integrity of their crops is protected is at the center of this bill. The federal system for regulating genetically modified organisms (GMOs) is an "outdated patchwork" according to Maluski, who said that protecting non-GMO crops is a hot topic nationally. He added that no other state has taken a leadership position on this issue, and doing so would put Oregon at the forefront of the debate. The bill basically gives the ODA the authority to establish legally binding isolation distances between GMO and non-GMO crops, necessary because pollen and seed from GMO crops can potentially contaminate fields of non-GMO crops. It's clear that Oregon industries like organic farms, organic seed producers and conventional vegetable growers can be potentially devastated by contamination from GMO crops. For instance, last November the Salem Statesman Journal reported that Monsanto Co. reached a $2.4 million settlement with Pacific Northwest wheat farmers who sued after unapproved genetically modified wheat was discovered growing in Eastern Oregon. According to the article, the discovery of the wheat had prompted Japan and South Korea to temporarily suspend some wheat orders, a disastrous situation in any industry. House Bill 2598: Prohibits the use of medically important antibiotics on healthy food-producing animals for non-therapeutic purposes such as growth promotion and disease prevention. Requires documentation of reporting of antibiotic use in large concentrated animal feeding operations in Oregon. Simply put, this bill says that large factory farms will only be able to use antibiotics on sick animals. 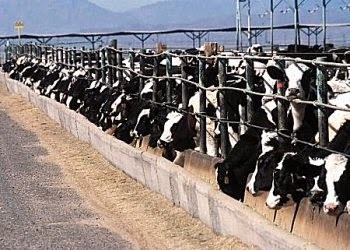 Currently, concentrated animal feeding operations (CAFOs) routinely use antibiotics on healthy animals to promote faster growth and for disease prevention (rather than treatment when an animal is actually sick). OSPIRG is currently taking the lead in this effort, positioning it as an important public health issue, since overuse of antibiotics in food-producing animals—meat animals in particular—is causing existing antibiotics used to combat human illness to lose their effectiveness. A prominent example of this was the outbreak of antibiotic-resistant salmonella traced to Foster Farms chicken that sickened hundreds across the country in 2014. 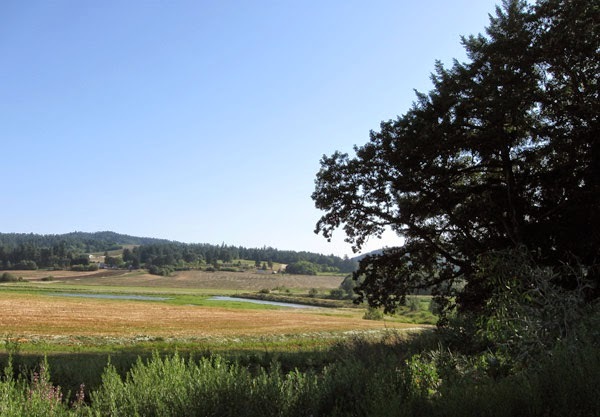 Senate Bill 204: Establishes a new Working Forests and Farms Advisory Program to provide low interest loans, loan guarantees and grants to help maintain or restore conservation benefits on working forests and farms. In essence this bill would provide loans, loan guarantees and grants to keep existing farmland in production and encourage farmers to pass their land on to a new generation of farmers rather than convert farmland to non-farm uses. Considering the average age of a farmer in Oregon is 58, it's critical for the continuation of our local food supply to keep farmland in production and provide avenues for new farmers to get onto the land. Establishing pilot projects to give Supplemental Nutrition Assistance Program (SNAP, formerly known as food stamps) recipients regular access and incentives to purchase fresh fruits and vegetables. Creating incentive areas and reducing roadblocks to the development of urban agriculture enterprise zones on underutilized city lots. Promoting agritourism through liability protections for farmers who want to offer public access to their property. Allowing farms to advertise raw milk sold on their farms. Currently farms are not even allowed to put that information on their websites. Click here for more information on the bills that are coming up before the Legislature this session. Find your legislators and let them know what you think. And stay tuned for further updates as the 2015 session progresses! Read the other posts in this series, The Good, The Bad and the Ugly, The Personal Gets Political , The Fight Takes Shape and Hanging in the Balance. Photos of Oregon Capitol building and CAFO from Wikipedia. It's a common malady among several of my friends. We're walking or driving someplace together and see a sweet little building or storefront that's been abandoned or underused, sometimes for years, and say, "Gosh, wouldn't it be fun to turn that into a darling café/bakery/bar/lunch spot." 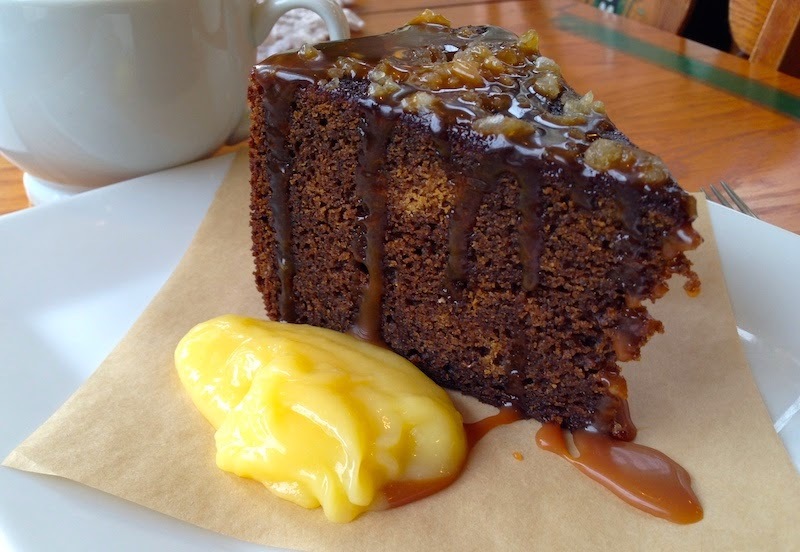 Ginger cake with lemon curd at Palace Cakes. We then fantasize about what the menu would be, whether we'd make our own pasta and which coffee roaster we'd choose for our house blend. Our dreaming never goes further than that, since most of us know folks in the food service industry and know what a crazy, backbreaking job it is to realize that dream of just the right place with just the right menu that finds just the right customers who come back again and again. 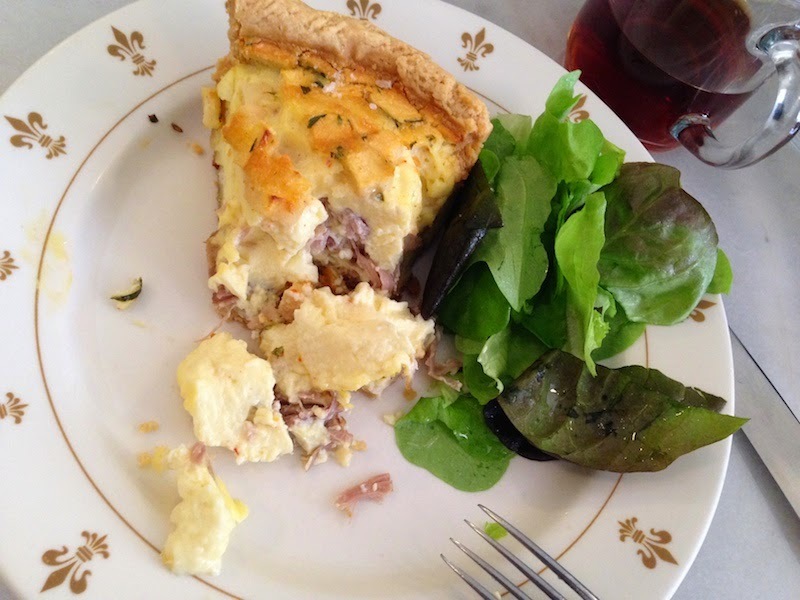 Two places that seem to have found that magic combination are Palace Cakes, Elizabeth Beekley's ode to pastries your grandmother would approve of, and Kristen Murray's Maurice, the sparkling white oh-so-French "pastry luncheonette." Both are teensy spaces with very limited seating, but seem to have hit that zeitgeist of place, time and offerings that spell instant success. Beekley's bakery scored a building I've had my eye on for years that sits just on the western edge of the pretentiously dubbed West End neighborhood. No newb to the pastry business, Beekley and her sister—they are two of eleven sibs, all apparently crazy bakers—took the town by storm in 2007 with tiny filled cookies sold from their Two Tarts stand at several farmers' markets. Gorgeous but not over-decorated, sitting on antique cake stands and vintage plates, Beekley uses basic ingredients to turn out deeply flavored cakes that pair perfectly with a cup of house coffee. 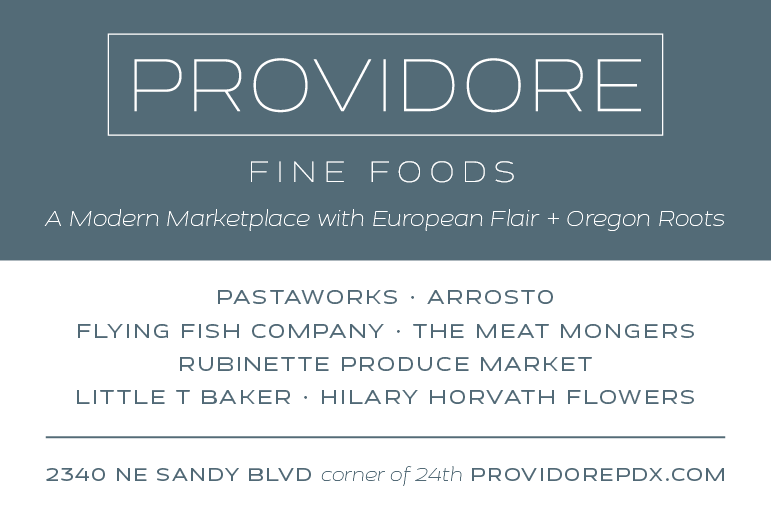 Maurice, located just across West Burnside from the Godzilla-like epicenter that is Powell's Books, is a bright oasis of civility, a little taste of the Île-Saint-Louis sandwiched in a row of non-descript storefronts. 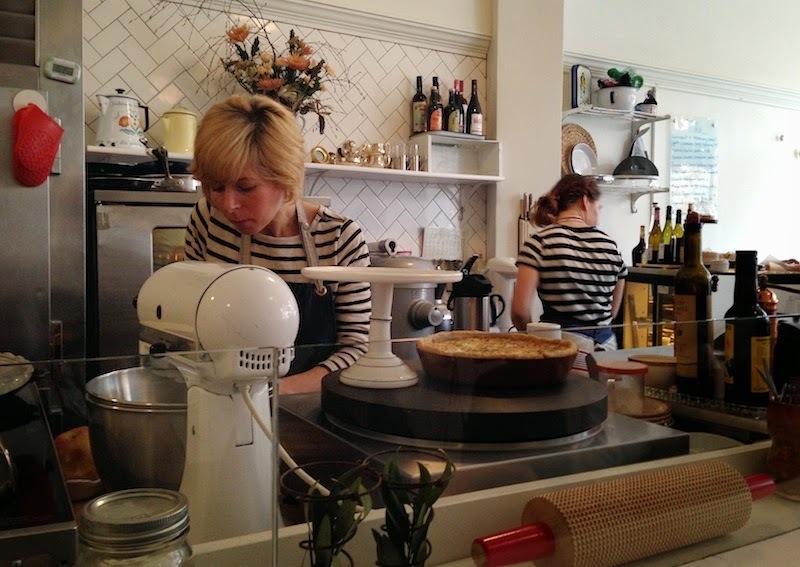 Like Beekley, Murray is no stranger to the pastry scene in Portland, having made desserts for the likes of Vitaly Paley's eponymous Paley's Place and the late Pearl District mega-bistro Fenouil. Savory and sweet baked goods are the focus of the intensely curated menu that may feature a light and fluffy seasonal quiche, a savory meat pie, lefse, poulet au pain or pigeon bisteeya alongside a perfectly composed green salad and desserts from tarte tatin to Swedish fika cookies and a glace du jour. 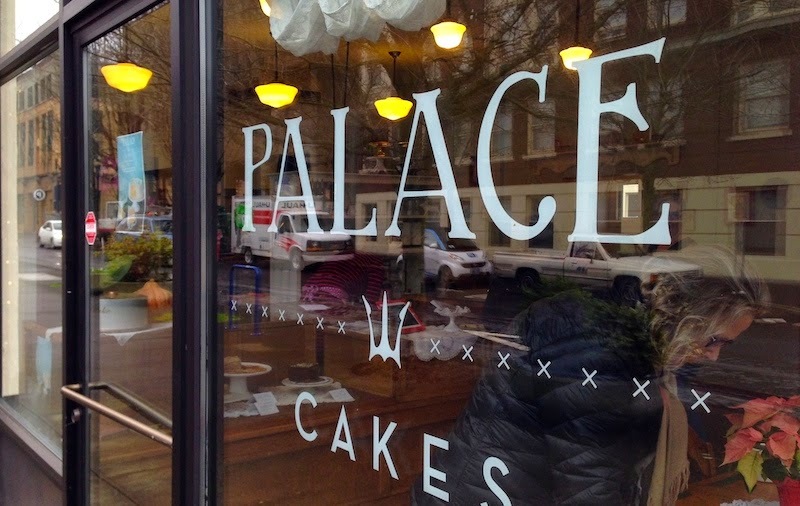 If my mother was still with us I'd take her to Powell's for a bit of book-browsing, then to Maurice for a light lunch and over to Palace Cakes for dessert. She would have called it a perfect day. Contributor Jim Dixon's annual olive oil garage sale is an institution among aficionados of good cooking and good eating in town. In the tradition of his beloved New Orleans, he always offers a lagniappe, or a little something extra, to his Real Good Food customers, usually something warming to drink and a cup of his famous "garage sale soup." Soak about a cup each of garbanzos and farro together in plenty of water overnight. Drain, add enough water to cover, stir in some salt, and simmer for an hour—longer is even better—or until the beans are tender. Cut up the rest of the ingredients while the beans and farro cook. Chop an onion, 3-4 stalks of celery and a few cloves of garlic. Chiffonade a bunch of collard greens (leave the center stalk attached; it'll cook enough to get tender). 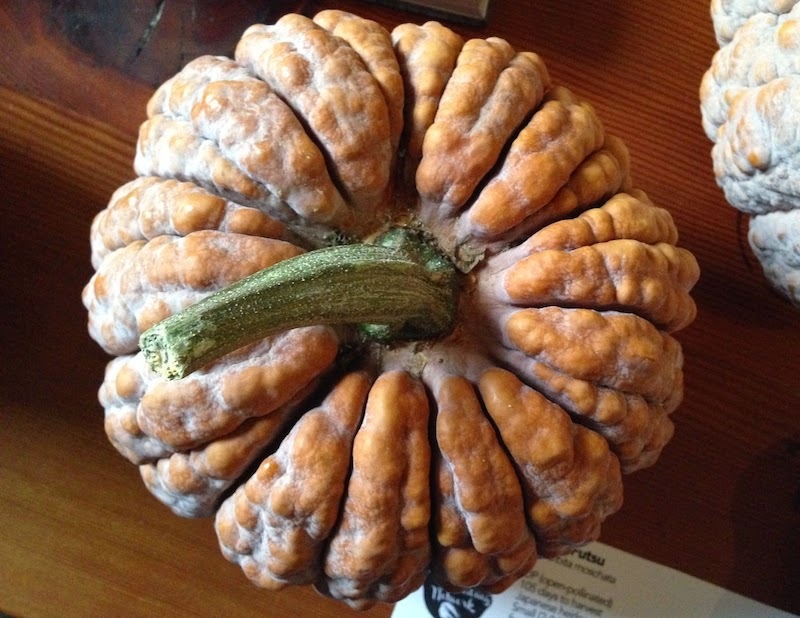 While I like to use one of the big, pumpkin-y squashes (Cucurbita maxima, like kabocha or Hubbard), for this, almost any winter squash would work. 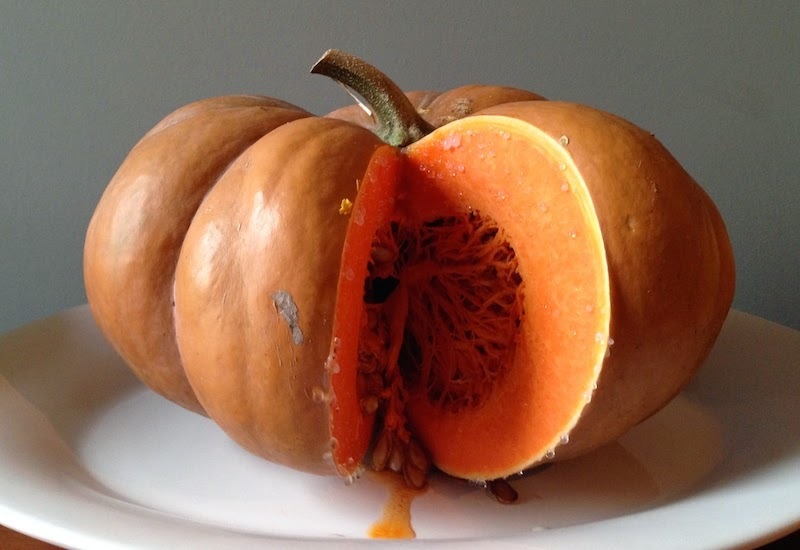 Cut it in half, pick out the seeds (roast them with olive oil and salt for about 25 minutes) then grate the raw pieces (and leave the skin on, even with the gnarly-looking kabochas). It’s easiest in the food processor, but a box grater works, too. You want about 2 cups worth. Add the grated squash, onion, celery, garlic and collards to the pot. Add a large can of diced tomatoes (or the tomatoes you roasted and froze last summer). Sprinkle in a good handful of Pantellerian oregano, pour in plenty of good olive oil, taste for salt and let the soup simmer for a couple of hours if you can. Soup always tastes best with long, slow cooking. Just before serving taste it again; if it seems to need a little something, add a splash of Katz Gravenstein apple cider vinegar [good quality regular cider vinegar works, too. - KB]. Drizzle with more oil at the table, and a pinch of Parmigiano would be good, too. Adaptation, the principle of change over time, plays a key role in the life history of an organism. So it is with farmers' markets, an organism of a somewhat different kind, consisting of farmers and tables, vegetables and bins, trucks and schedules, shoppers and boards of directors. Like any organism, it must adapt and change as the needs of its component parts shift over the years. 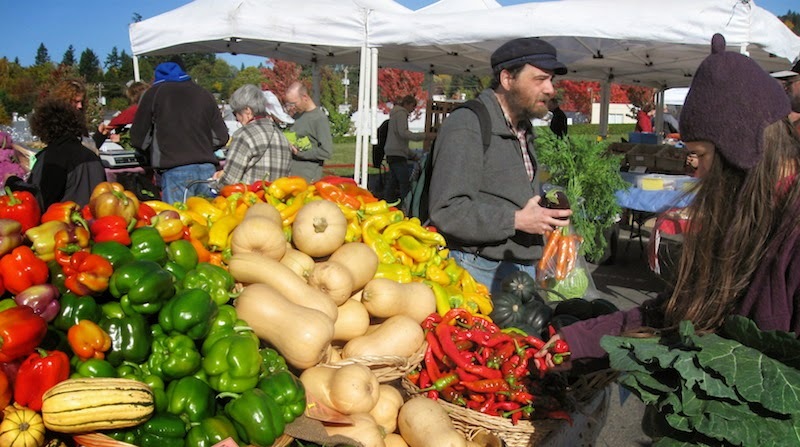 Contributor Anthony Boutard of Ayers Creek Farm has a few suggestions for ways that the Hillsdale Farmers' Market might adapt to a changing environment. We hope the market will establish 1:00 p.m. as a permanent closing time, a sentiment that is gathering steam among the dusty-footed vendors, the piepoudres. After 12 years (245 market days to date), both summer and winter, on the pavement at Hillsdale, we know that 70% of our sales consistently take place in the first two hours of the market, and the last hour accounts for less than 5% of our sales. 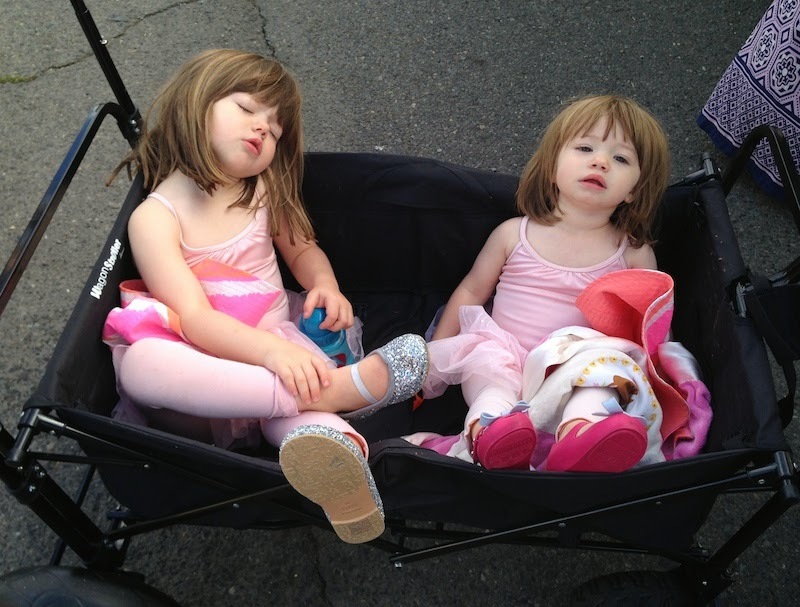 If the day is rainy, cold or hot, the market is dead as a smelt by noon. No wonder, produce quality is best in the first two to three hours, especially in the summer heat, as most of you know. A 1:00 p.m. closing time year-round is sensible. The board should consider other changes over the next year. When the market moved across the highway to its current location, it grew substantially and went from a summer fling to a year-round relationship. The ease of access to arterial streets and good parking have been critical assets in attracting farmers and customers. Unfortunately, the addition of bike lanes on Vermont Avenue had a negative influence on traffic at the market by eliminating a long stretch of parking spaces. Rather than grousing about the clumsy transportation planning by the city, as easy as that is to do, it is much more productive to rethink how the market uses the site. Currently, the market stalls occupy more than 70 parking spaces. It is possible to free up these parking spots by creating a space for the vendors on the flat area to the west of the lot, between the lot and the slope leading down to the soccer fields. This would make shopping at the market much easier. There are minor challenges reconfiguring the area, but none insurmountable. The parking lot is unlovely and in need of repair, so it is a good time to address improved utilization of the site. Hillsdale is one of the few markets in the region, if any, so well-poised for improvement. As the market has developed into a year-round enterprise and is no longer an experiment, safer shelter is warranted as well. A simple 45' by 180' freestanding structure covered in rip-stop polyethylene (left) costs $30,000, with some bells and whistles available for an additional pittance. Simply put, the neighborhood can have a safe and comfortable covered market for roughly the same price as a plain vanilla family car. 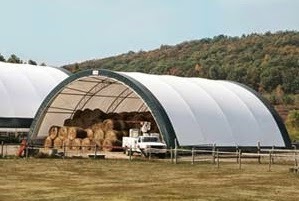 Farmers use these durable and utilitarian structures for a wide variety of uses, including as shelters for farmers' markets, so we recognize them as our preferred habitat. Not particularly posh or elegant, true, but they are engineered to survive heavy snow loads and wind. The sunshine passes through while providing shade and shelter for the fruits and vegetables below. As you will note from the link, these structures are manufactured in 14 days, the cover is warrantied for 20 years, and the frame for 50 years. They are assembled in a matter of days as well. From a farmer's perspective it is a very good value. Aside from leveling and preparing the site, there is no foundation or excavation required, a massive cost savings relative to any other cover option. When the market isn't using the shelter, it can be available for school functions or neighborhood events. In other words, it will be a general community asset rather than a dedicated market space. Hillsdale has an experienced cadre of farmers, some of whom, like us, have been part of the market since it started in 2002. Having adequate parking and a sturdy covering for the market will make it a preferred destination for both farmers and customers for years to come. With some vision and cooperation on the part of the Hillsdale Farmers' Market board and the neighborhood, the rag tag assembly of tents set up on Sundays can evolve into a defining neighborhood fixture. We hope you all encourage Eamon and the board to think creatively about the future of the market. Your voice, encouragement and participation is important. I've said it before, I'll say it again. My neighbors rock. The folks next door are both scientists, love dogs, make great cocktails—the husband gave Dave his recipe for Manhattans, which we've been happily slurping up ever since—and invite us to their yard parties. A couple of doors down are two tremendous cooks who've fed us lovely dinners and even let us make bread in their oven when ours was on the fritz. The house behind us was formerly occupied by a grumpy gus who never cottoned to the young hippies (us) who moved in, started cutting down the laurel bushes that nearly engulfed the house and taking down the cyclone fencing. A few years ago he sold his house to a young couple who, within a week of moving in, planted a 100-foot-long garden along the south-facing street side and announced we could help ourselves to the bounty. Susana eventually opened her own cooking school with her best friend and fellow instructor Melinda, who felicitously happens to be a master butcher (yes, this is a fairy-tale relationship). Ever the good neighbor, Susana called the other afternoon asking if I'd be interested in a batch of stew left over from a Korean cooking class that her students couldn't finish because they were too full from the other dishes they'd made. I've had enough of her cooking to know a terrific dinner had just fallen into my lap, and ran over immediately to pick it up. 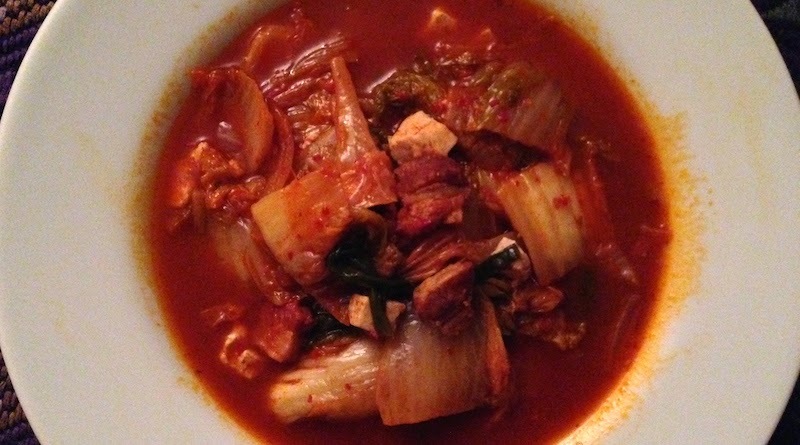 The base of the stew was a delicious fresh kimchi they'd made in class, augmented by a combination of tofu and some pork belly from a pig Melinda had butchered for a class the day before. I extracted a promise that she'd share the recipe before dashing back home to warm it up for dinner. Exquisitely flavored and needing nothing more than some fluffy rice to make a company-worthy feast, this dish is destined become a regular addition to our dinner repertoire. I can't wait to start trying it with some of the terrific locally made kimchis available in town (Choi's, I'm thinking of you! ), and it's giving me a very good reason to attempt making some of my own in the near future. Brown the pork belly and then add the onions to brown, then add garlic. 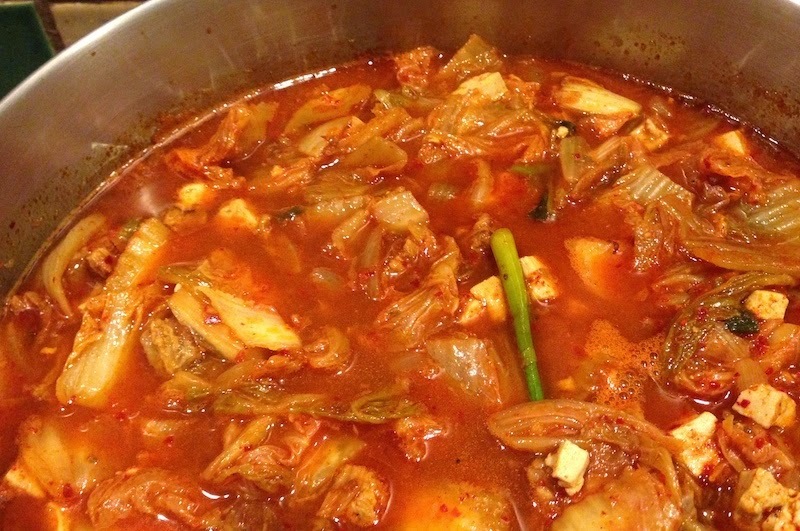 When garlic is slightly browned, add in kimchi and stock and let simmer on low for about 30 minutes. Add in tofu and let simmer for a final 5-7 minutes to warm tofu through and season to taste with salt, pepper and fish sauce.